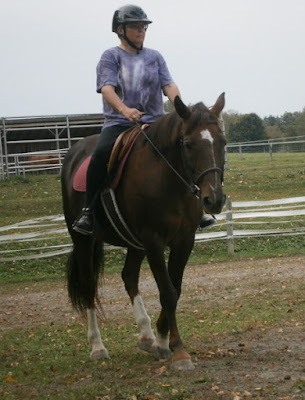 In September, I leased Pompera, my main squeeze, and we went on an adventure. (I'd been telling her about it for months!) 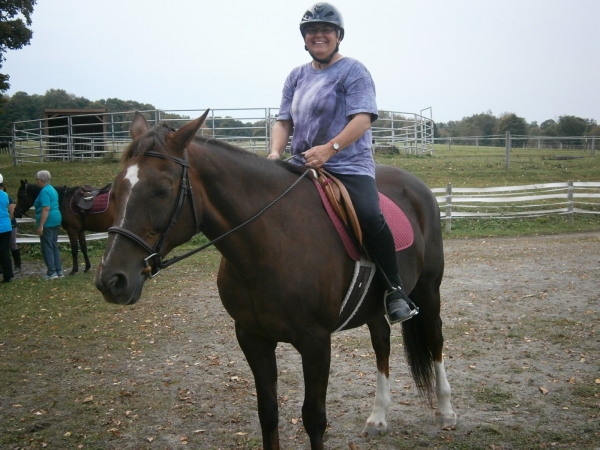 Strawberry Fields, where I take lessons, trailered Pompera to a different farm where the two of us participated in a Centered Riding Teacher Certification clinic. Whoa back, readers...we were student riders, not going for teacher certification! 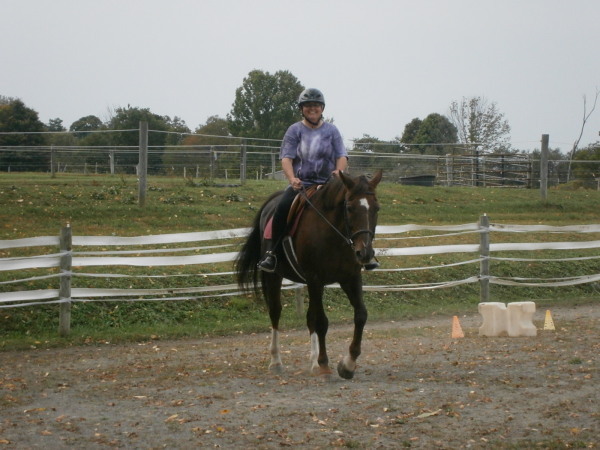 I was lucky enough to spend four whole days with Pompera and other horse-minded people. And other horses, too! These pictures were taken on day three. I was assigned two teacher candidates. They alternated days of being lead teacher and assistant. While we completed paperwork in which we stated what we hoped to accomplish, I also added that I was willing to learn anything they wanted to teach me! What a blast! Four days of being at the barn over 12 hours a day! Cleaning stalls, feeding, watering, grooming--ahhh, spa days indeed. I got home each night dirty, tired, and eager to go back. The moral of this story? Grab the gusto while you can. I don't want to get to the end of my life and say "I wish I had". What makes your heart sing? An old saying, but one I've taken to heart the last few years: If it is to be, it is up to me. I can make it happen if I want it enough and am willing to work for it. How about you? Interviews, FBI screenings, Secret Service...manicures, facials, spa days, wardrobe consults...it just goes on and on. Learning to walk in heeled shoes. Must be I am being taken more seriously in my fourth bid for President! (wink, wink) There was a lot of head shaking (not in a good way) when I brought up the subjects of tiaras and (weighted) scepters. Thanks for your patience. Here's a brief tour of what others are achieving! First, Sharon N, Pat S, Gale, Pat A, and Cheri learned to make flying geese units the old-fashioned way--with quarter- and half-square triangles! 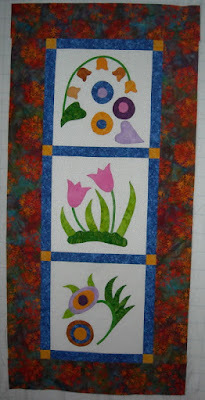 They all did a beautiful job and have enough fabric to make a second block with the two main colors reversed! 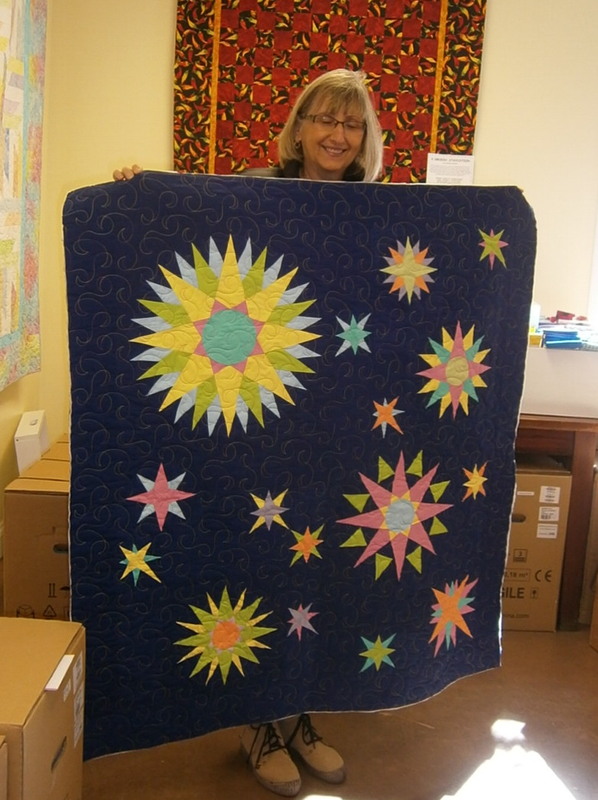 Karen H. just has to bind her Mariner's Compass Bliss project--what a stunner it is! Great job, Karen! 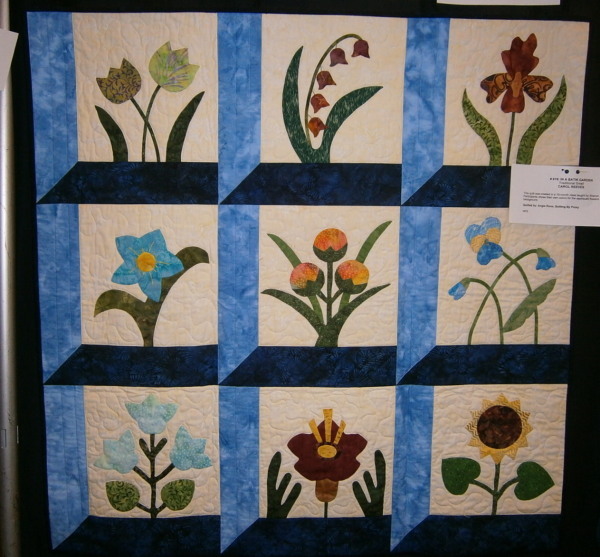 Carol R, a frequent flyer here on the blog, had her Green Thumb wall hanging at the Tompkins County Quilters Guild show a few weeks ago. Just delightful, as always! And Cindy O sent me this pic of 3 Unlikely Friends that she started last summer at retreat. 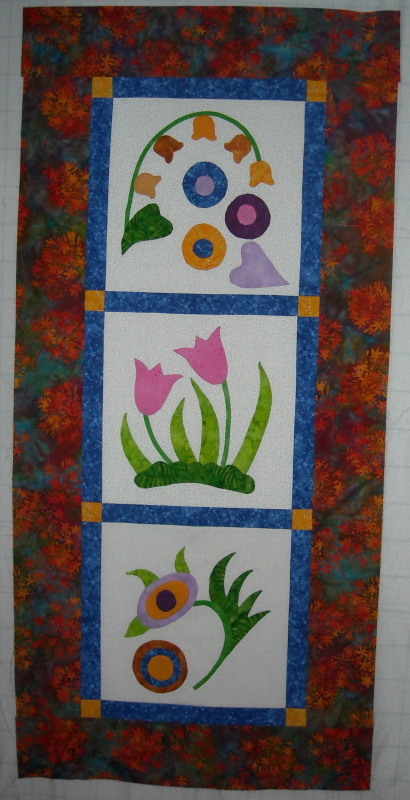 The setting fabrics add spark to the blocks! Yippee! The three blocks from Three Unlikely Friends were designed at the same time as the ones for Green Thumb. They definitely did not do well with those nine, so I made a separate hanging out of them. A very different feel. I love them both. Next up: What I did in September. Or maybe something else. P.S. I finished X by Sue Grafton, Make Me by Lee Child, Tripwire by Lee Child.